Galion's unique subrame provides integral strength at all times. The frame is constructed as an integral unit, designed to give increased strength with a minimum of weight. Heavy weldment cast steel I-beam lift links, heavy duty cast steel hinges, heavy cast steel crosshead construction and high strength center section with high carbon steel end pins along with a heavy steel channel subframe makes this a rugged municipal hoist built for years of service with minimum maintenance. 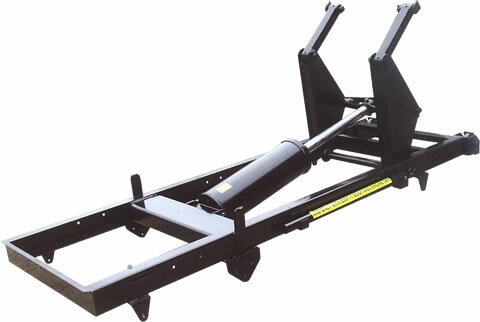 This subframe is built with A572 grade 50 high tensile steel & 4140 grade weldable castings. Max. Lifting Capacity* 39,000 lbs. 52,000 lbs. Weight** 796 lbs. 796 lbs. Displacement 1050 cu. in. 1050 cu. in. Piston Rod Diameter 2.5" 2.5"
*Governed by body length and pivot. ** Includes all mounting equipment.